Need to refill your holiday spirit? 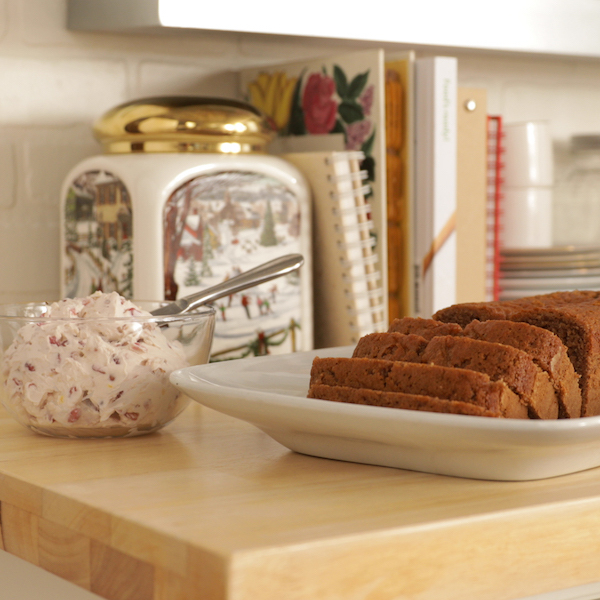 A slice of this gingerbread loaf spread with lemon and pomegranate cream cheese along with a cup of tea should do the trick. It even makes a wonderful breakfast. Follow the package directions to make the cake, and bake it in a greased and floured loaf pan. It will need longer to cook—anywhere from 45-55 minutes depending on the size. While the cake cools, stir together the cream cheese, pomegranate seeds, and lemon zest until well blended. Once the cake is cool, slice and spread with the cream cheese mixture.